The Toy Soldier is an Emblem Heartless that is found in Kingdom Hearts II. The Toy Soldier has two forms, one of which resembles a human soldier. Its head is spherical, navy blue, and sport glowing, yellow eyes and a jagged mouth. It wears a red jacket with two rows of white buttons lining its front, a black belt with a yellow buckle, and large, yellow gloves. It wields a stylized musket to shoot at opponents from a distance. It wears a tall, black bearskin hat with a white, zig-zag pattern near its base. The Toy Soldier's alternate form is the same jack-o'-lantern design as the Graveyard. The only significant difference between the two is that the "legs" that sprout out of the bottom of the box are wearing white gloves in this version. The lower body of the Heartless in both forms is that of a predominantly grey box with black edges. The front face of the box is mostly red with a black section at its base, as well as two "eyes" made up of a yellow "X" and an angular spiral of the same color. A yellow crank is visible on the right side of the box, causing it to resemble a jack-in-the-box, and the Heartless emblem is the latch that keeps the lid shut, connecting to a small, yellow rectangle at the top of the front face of the box. In Kingdom Hearts II Final Mix, the Toy Soldier's coat becomes white and its gloves become red, as does the stripe on its hat. The box is now mostly navy blue, except for its inner lid, which is red, and its front face. The front face is now predominantly black, the small section at the base is red, and the two symbols are white. The edges of the box are yellow, and the crank is now green. The small rectangle at the top of the front face is now white. The Toy Soldier's name reflects its resemblance to a classic toy soldier, referencing Santa Claus and his toy workshop. The Toy Soldier is a slightly difficult enemy. It is hard to avoid its attacks, since it has short-range and long-range attacks. Try to avoid its rifle attacks and try to get up close to it. Sora can land a few hits now but it will most likely jump away. If it shifts to its pumpkin form and starts to slash Sora with its weapons, Reflect works well. Occasionally, it will seal itself up the moment it recovers from its attacks. 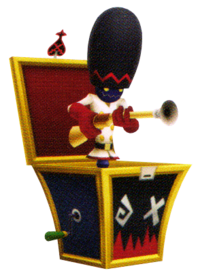 The Toy Soldier as it appears in Halloween Town in Kingdom Hearts II. The Toy Soldier's Pumpkin Form. 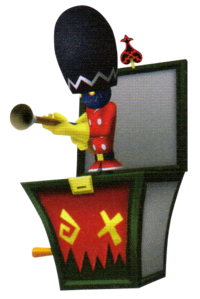 The Toy Soldier's Pumpkin Form as it appears in Kingdom Hearts II Final Mix.